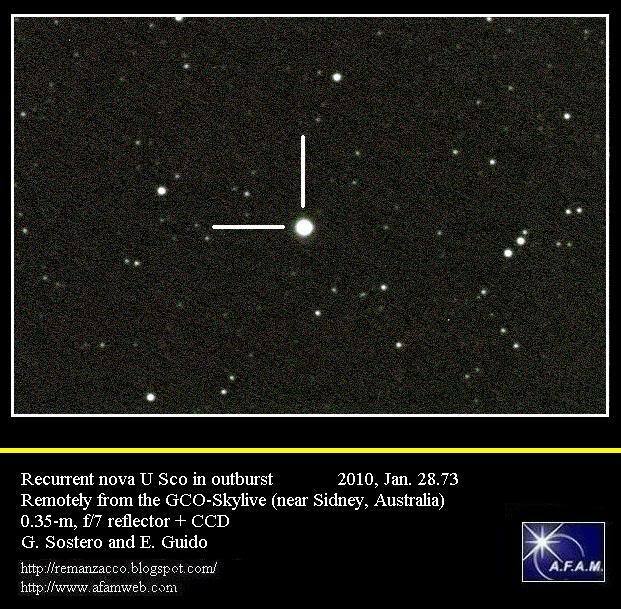 The recurrent nova U Sco has been discovered in outburst at magnitude V=8.05 on January 28.4385 UT by amateur astronomers B. Harris and shortly after by S. Dvorak (who estimated it at V~8.8). According to the AAVSO website prior to outburst, U Scorpii was measured at V=18.2 on Jan 27.4501 (Harris), and estimated at m(vis) less than 16.5 on January 27.6271 by M. Linnolt. Novae are binary systems where the companion star feeds matter through an accretion disk to accumulate on a white dwarf. After the eruption, the white dwarf returns to a steady state while the accumulation begins anew so that all novae recur. Each white dwarf will undergo many such eruptions, with the typical timescale between eruptions perhaps as long as 100,000 yr, although a subset of the nova population (called recurrent novae [RNe]) has recurrence timescales from 10 to 100 yr.
U Sco is one of the most famous recurrent novae. In quiescence it usually hovers around magnitude 17.6, but in outburst it briefly shoots up by about 8 or 9 magnitudes. In fact, U Sco is the all-time fastest nova known. Its brightening from minimum to maximum takes only about 5 hours, and its decline to two magnitudes below maximum takes about 38 hours. U Sco's last three eruptions, in 1979, 1987, and 1999, were all discovered by amateur astronomers. One year ago, Bradley Schaefer predicted that the recurrent nova U Scorpii was due to explode again in April 2009 ± 1.0 year. Schaefer searched the old photographic sky-patrol plates stored at the Harvard College Observatory to discover three more eruptions of U Sco. With these, the pattern of eruption since 1900 has been once every 10 ± 2 years. (Eruptions were likely missed around 1927 and 1957 because Scorpius is hidden in conjunction with the Sun every November and December). Moreover, for his prediction, Schaefer used the system's brightness in quiescence (slightly variable) as a measure of the rate at which matter is falling onto the white dwarf. On Vsnet mailing list T. Kato reports that Imamura-san (Okayam U. of Sci.) and Fujii-san have obtained spectra of U Sco on January 28.8. Kato comments that P Cyg-type components having a velocity of 4300 km/s for Halpha (Fujii). The lines of He I and N II were strong (also associated with P Cyg-type components). The FWHM of Halpha was 6100 km/s (Imamura). Within an hour of the discovery, U Sco had already be observed by two X-ray satellites (the Rossi X-Ray Timing Observatory and the INTEGRAL satellite). In the following weeks the recurrent nova will be observed by many ground-based telescopes and spaceborne observatories. These observations will help to answer some questions about the suspected link between RNe and Type Ia SNe. Although it seems that for systems like RS Oph and U Sco, the mass of the White Dwarf (WD) is near the Chandrasekhar limit and increasing, there remain some fundamental questions. For example, what is the type of the WD (if ONe, then no SN explosion will occur); can the Hydrogen in systems with red giant secondaries really be “hidden” at the time of any SN outburst; is the population of (appropriate sub-type) RNe sufficient to explain the observed SN Ia rate? A combination of detailed observations of individual Galactic RNe, coupled with surveys of extragalactic novae, will help to answer these very important points. (Bode, 2009). CBET circular No. 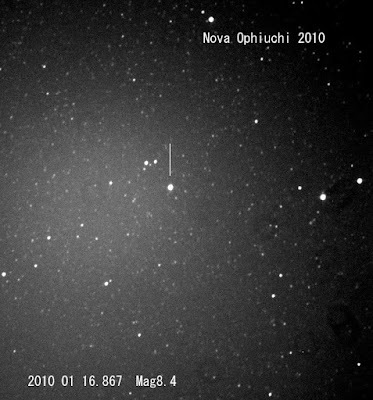 2140, issued on January 23, 2010, announces the discovery by John Seach (NSW, Australia) of a possible nova in Sagittarius (mag 8.5) on three 6-s CCD exposures (limiting mag 11) obtained on Jan. 20.22 UT with a Nikon D300 camera (+ 50-mm f/1.4 lens + orange filter). Follow-up observers on CBET are noting that nothing is visible at this position on a DSS image. On CBET circular No. 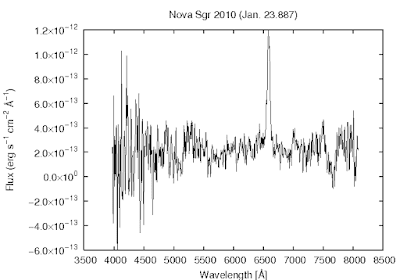 2142, H. Maehara (Kyoto University) reports that a low-resolution spectrogram (range 400-800 nm) of the possible nova was obtained on Jan. 23.887 UT with the 25-cm telescope of the Kwasan Observatory. The spectrum shows H_alpha, H_beta, and Fe II emission lines. These features suggest that this object is a "Fe II"-class nova. After the bright sungrazing comet discovered on January 02, 2010 on images taken by NASA's STEREO-A spacecraft, a new comet is plunging toward the sun. On first looking this comet is ~1-1.5 mag fainter than the previous one from early January. As expected, this sungrazing comet has not survived to its close encounter with the sun. 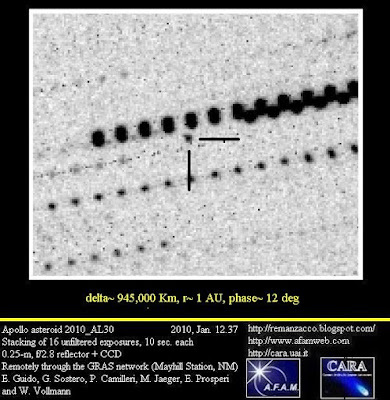 According to K. Kadota nothing is visible at this position on a red Digitized Sky Survey image from 1997 (limiting mag estimated to be 20 by S.Nakano). According to CBET circular No. 2139, Hiroyuki Maehara (Kyoto University) reports that a low-resolution spectrum (range 400-800 nm) of this object was obtained on Jan. 22.890 UT with the 25-cm telescope at the Kwasan Observatory. 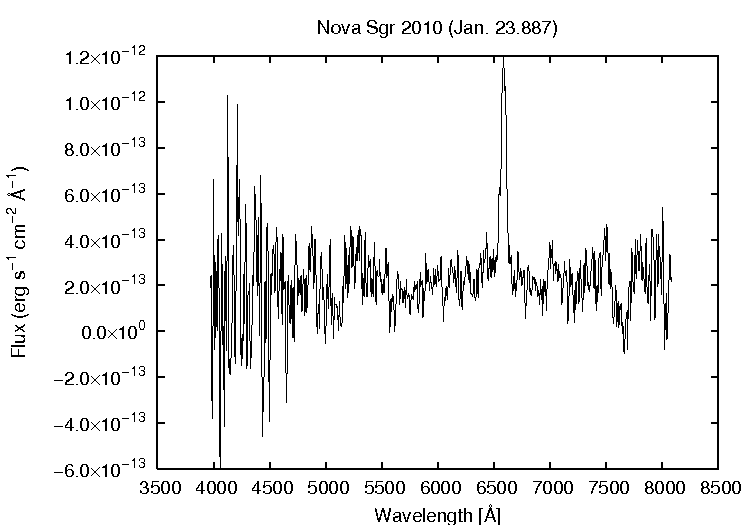 The spectrum shows H_alpha and Fe II emission lines and suggests that this object is a classical nova just after maximum. IAU circular No. 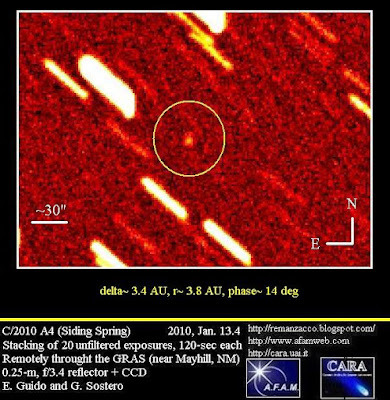 9107, issued on 2010, Jan. 14, announces the discovery by G. J. Garradd of an apparently asteroidal object, on CCD images taken with the 0.5-m Uppsala Schmidt telescope in the course of the Siding Spring Survey. 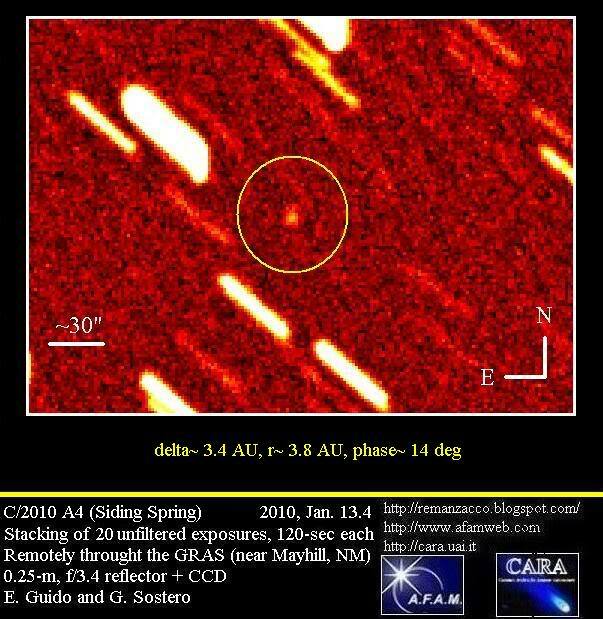 After posting on the Minor Planet Center's 'NEOCP' webpage, Garrad itself and other observers have noted the cometary appearance of this 19.0 magnitude object, designated C/2010 A4 (SIDING SPRING). We have been able to confirm this object remotely, through the GRAS network, using a scope located in Mayhill (NM): on 2010, January 13.4, co-adding of 20 unfiltered exposures, 120-seconds each obtained by means of a 0.25-m, f/3.4 reflector + CCD, show a diffuse coma nearly 8" in diameter with a very weak central condensation. 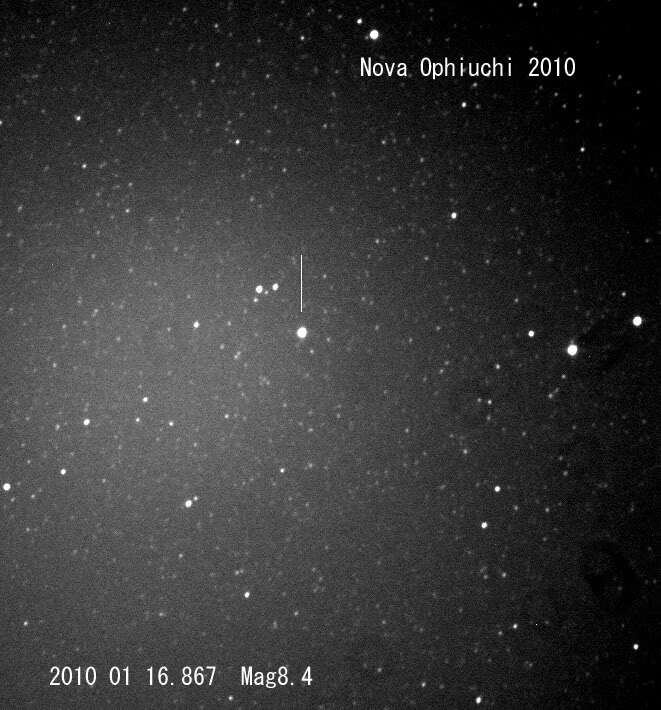 The first and preliminary orbit for comet C/2010 A4 (SIDING SPRING) indicates perihelion on Oct. 8, 2010, at about 2.7 AU. This is the 67th comet for the Siding Spring Survey. 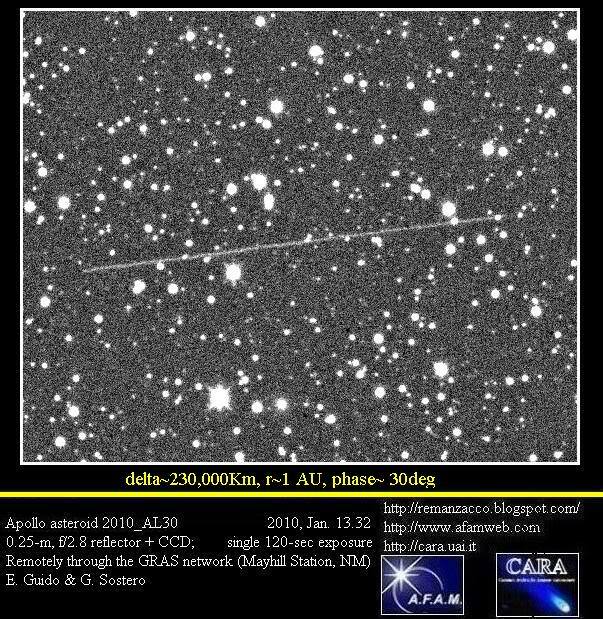 Just few hours before the close approach of small asteroid 2010 AL30 to Earth at about 0.34 lunar-distance, we have been able to image it remotely through the GRAS network, using a scope located in Mayhill (New Mexico). MPEC 2010-A59 issued on on 2010, Jan. 11 announces the discovery by Linear survey of a new object designated 2010 AL30. According to the preliminary orbit, 2010 AL30 will approach Earth at about 0.34 lunar-distance at 1248 UTC on 13 Jan. 2010 at magnitude 14 and it will be moving at about 10 arcsec/sec. We have been able to follow this object while it was on the Neocp. The object has a value of H=27.0 (about 10/15 meters) and has an orbital period of 1.00 yr. On Minor Planet Mailing List, there was some early speculation that the object could be a man-made object rather than a natural one. But according to Alan W. Harris : "..it is unlikely to be artificial, it's orbit doesn't resemble any useful spacecraft trajectory, and its encounter velocity with the Earth is not unusually low, around 9.5 km/sec "v_infinity". Perfectly ordinary Earth-crossing orbit". The radar team at Goldstone is attempting to schedule time for radar observations of 2010 AL30 early on January 13. The pointing uncertainties are currently large, so optical astrometry is required. 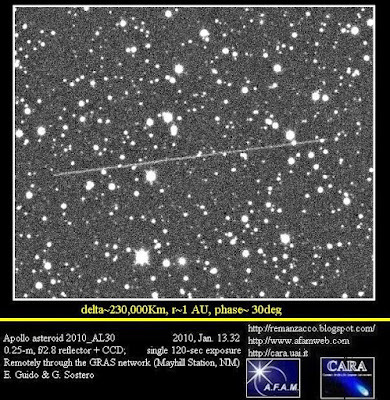 We have been able to follow-up 2010 AL30 on Jan. 12.37 through the GRAS network, using a scope located in Mayhill (NM). Below you can see our image obtained by co-adding of 16 unfiltered exposures, 10-seconds each obtained by means of a 0.25-m, f/3.4 reflector + CCD. 2010 AL30 has been classified in the JPL Small-Body Database as an Apollo-type asteroid. Apollo are Near-Earth asteroid with orbits that cross the Earth's orbit similar to that of 1862 Apollo. IAU circular No. 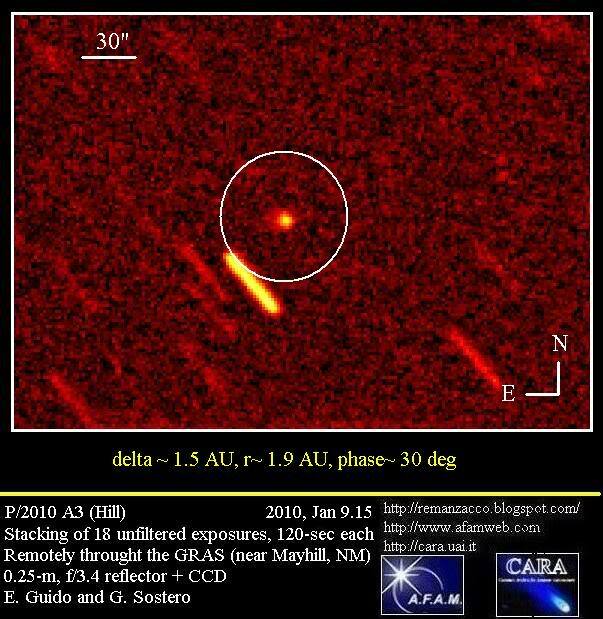 9106, issued on 2010, Jan. 09, announces the discovery of another comet by R. E. Hill, named C/2010 A3. It was discovered with the Catalina 0.68-m Schmidt telescope + CCD in the course of the Catalina Sky Survey. 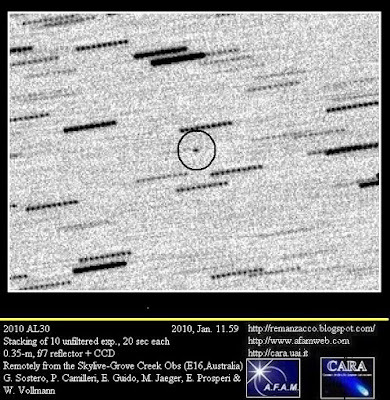 After posting on the Minor Planet Center's 'NEOCP' webpage, other observers have noted the cometary appearance of this 18.0 magnitude object. We have been able to confirm this object remotely, through the GRAS network, using a scope located in Mayhill (NM): on 2010, January 09.1, co-adding of 18 unfiltered exposures, 120-seconds each obtained by means of a 0.25-m, f/3.4 reflector + CCD, show a coma nearly 10" in diameter and a broad fan-shaped tail about 10" long in p.a. 50 deg. 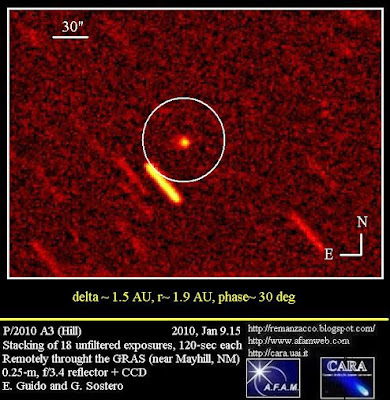 The first and preliminary orbit for comet C/2010 A3 (HILL) indicates perihelion on Mar. 27, 2010, at about 1.65 AU. This is the 3rd comet discovery of 2010 (after P/2010 A1 (HILL) and P/2010 A2 (LINEAR)) and the 21st comet discovery for Hill. Australian amateur astronomer Alan Watson discovered on January 02, 2010 a bright sungrazing comet in the images taken on December 30 by STEREO-A spacecraft. 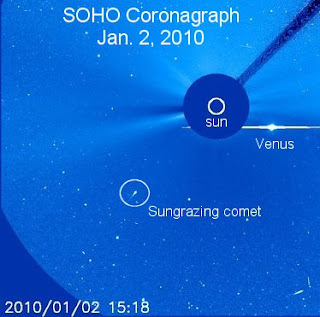 A sungrazing comet is a comet that passes extremely close to the Sun at perihelion. While small sungrazers can be completely evaporated during such a close approach to the Sun, larger sungrazers can survive many perihelion passages. According to a message by Wentao Xu on comets-ml mailing list, the comet has reached magnitude 4 on January 02.36. Magnitude right now (January 02 at 22UT) is perhaps 0 (maybe -1). While here you can see the frames used by A. Watson to discover the comet in Stereo images. Look for the faint streak rising from lower left. 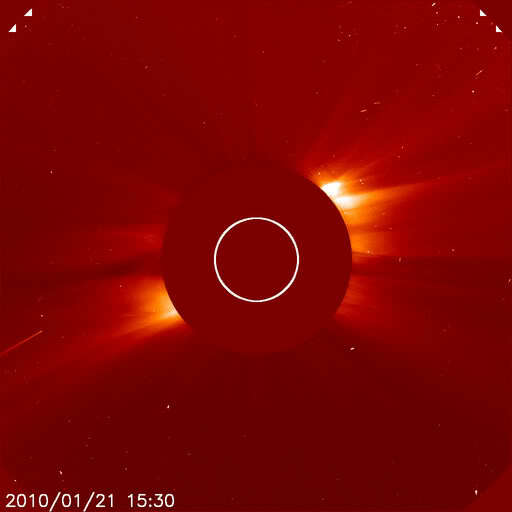 According to the latest Soho images the comet has not survived to this extremely close passage near the Sun.